Astronaut Mark Lee tests the SAFER system. 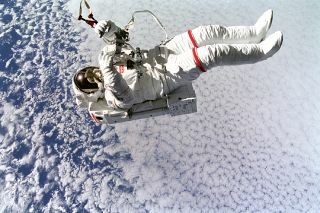 In this historical photo from the U.S. space agency, astronaut Mark C. Lee floats freely, backdropped against clouds 130 nautical miles below, without tethers as he tests the new Simplified Aid for EVA Rescue (SAFER) system on September 16, 1994. When astronauts are in orbit, it's often said they're weightless and there's no gravity. But of course there is gravity. What's really going on is they are falling sideways as they fall toward the planet, a setup that keeps them in orbit and feeling weightless.